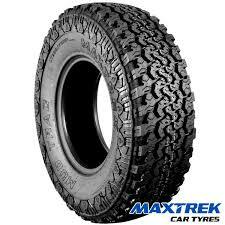 Hill Tracker tyres from Maxtrek are great all terrain tyres that give you the best performance possible at all times. Enjoy great traction and stability on any surface and in any weather conditions with these tyres, which are also durable and reliable. You can trust them not to fail on your journey and always reach your destination. Available at great prices, these Maxtrek options will prove their worth over their lifetime.